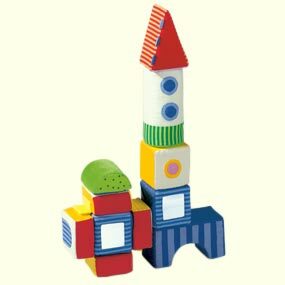 Baby's first set of building blocks. This colorful little town is full of surprises. It rustles, rattles and twittles. Smooth soft walls of fabric and other material entice the children to touch and create. 11 building blocks of cotton/polyester and filled with foam. Hand washable. Cube measures 2.7" x 2.7" x 2.7". Designed in Germany by HABA.